I finally visited the city I have been dreaming about for ages. I don´t know why it took me so long, but nevertheless, I made it there. 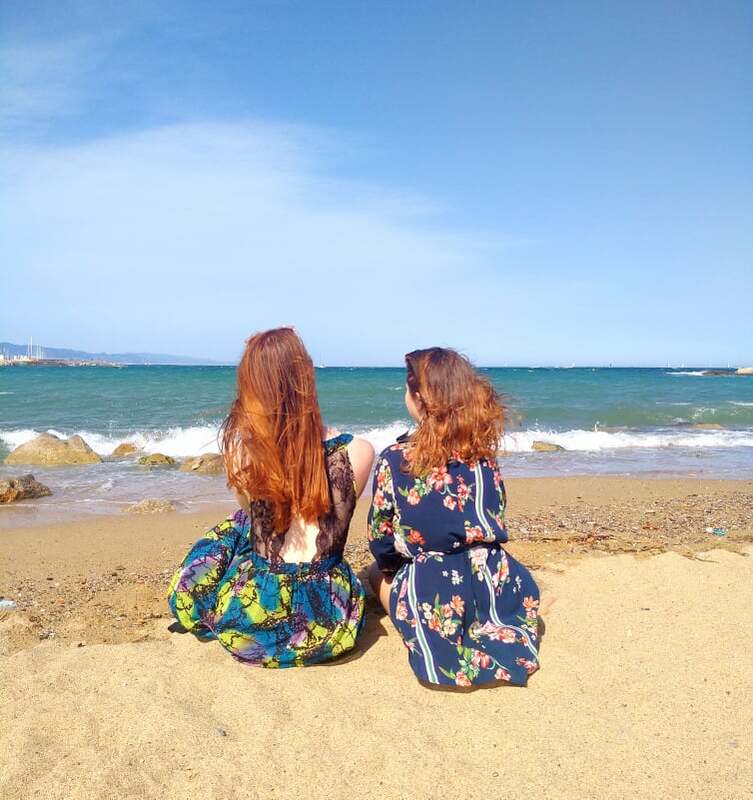 My two friends and I booked an apartment near the city center and we started discovering Barcelona. There are two things I love: sea and food. Or food and sea to be more specific. Food always wins the battle (unless there is Tom Hiddleston in the sea, then screw the food 😀). But since my friend never saw the sea (only in TV shows and that does not count) we went to the beach and it was amazing. It was relaxing yet full of energy. Just one hour there and you feel so happy (and sunburned in my case). It took me a short while and I was in love. In love with Barcelona. As I already mentioned, I love food. So it was necessary for us to get a great brunch. None of us were in Barcelona so it was time to get some help. And by help, I mean Instagram. I don´t know how about you, but I use it a lot. And not only for posting my own pictures, but also for getting inspiration. That also counts when searching for good restaurants and cafes. I have heard about this place from other bloggers and the photos looked amazing. We had to go. So we went. It was not far from where we stayed and we recognized the place fairly easily. There was a huge line of people wanting to try their food. We were waiting about 10 min and it was worth the wait. 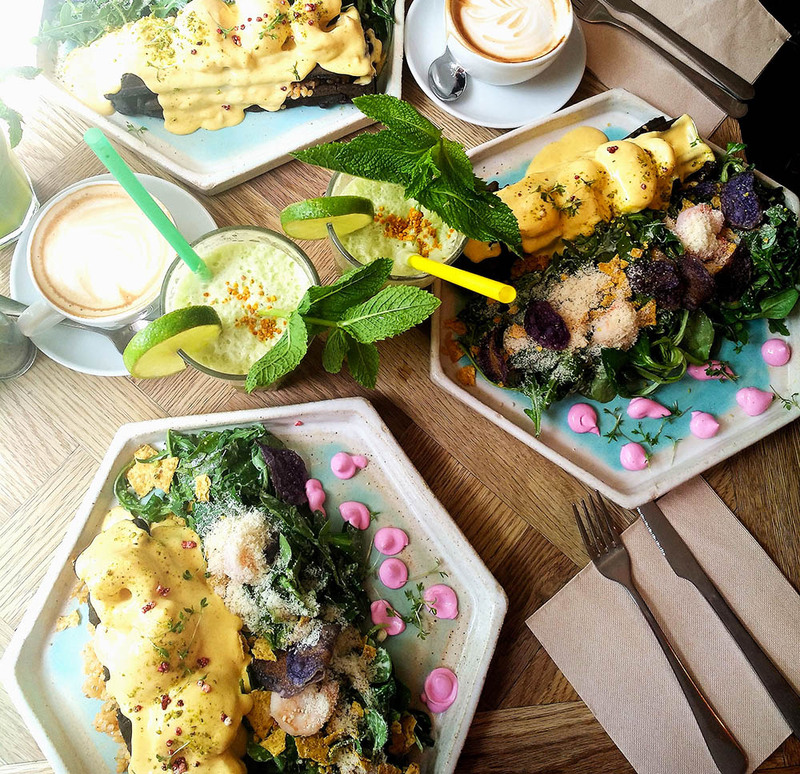 Not only the food looks like a piece of art, it is also delish! The combination of flavours is so strange yet it somehow works. I really recommend Brunch & Cake! Konečně jsem navštívila město, o kterém jsem tak dlouho snila. Nevím, proč mi to trvalo tak dlouho, ale nakonec jsem se tam přece jen podívala. S kamarádkami jsme si zarezervovaly pokoj kousek od centra a vydaly jsme se do srdce Barcelony. A kam šly naše první kroky? Jsou dvě věci, které miluju. Moře a jídlo. Tedy spíš jídlo a moře. Jídlo vždycky vyhraje (tedy pokud není v moři Tom Hiddleston, v tom případě může jít jídlo k čertu😀). Jelikož ale moje kamarádka nikdy neviděla moře (tedy kromě v televizi a to se nepočítá), šly jsme na pláž. A bylo to skvělé. Stačila jen hodina a člověk se cítil nabitý energií (a v mém případě to stačilo na spálení). Stačila chvilka a já se zamilovala. Do Barcelony. Brunch & Cake je boží! Jak už jsem zmínila, miluju jídlo, takže bylo nutné dojít si na nějaký skvělý brunch, Nikdo z nás v Barceloně před tím nebyl, a proto jsme potřebovaly pomoc. Instagram. Nevím, jak vy, ale já používám Instagram dost často. Ne jen na nahrávání vlastních fotek, ale také pro inspiraci. A to platí i v případě, že hledám dobrou restauraci nebo kavárnu. O tomto místě už jsem slyšela od ostatních blogerek a všechny fotky vypadaly skvěle. Musely jsme tam jít. A tak jsme šly. Nebylo to daleko od našeho ubytování a místo jsme našly poměrně snadno. Už z dálky jsem viděly frontu lidí, kteří trpělivě čekali na jejich skvělé jídlo. Počkali jsme asi 10 minut a stálo to za to. Jídlo vypadá na talíři nádherně a je strašně dobré. Kombinace chutí, které by mě nenapadly, ale přesto fungují! Vážně vám Brunch & Cake doporučuji! I was traveling with architect which is both great and horrible. Don´t get me wrong, I love her, but sometimes she was showing me a perfectly normal (in my opinion) ceiling and talked about it for hours (ok, it might have been minutes) like it was the greatest thing in the world. The good thing was that she really knew her stuff and we did not miss anything. 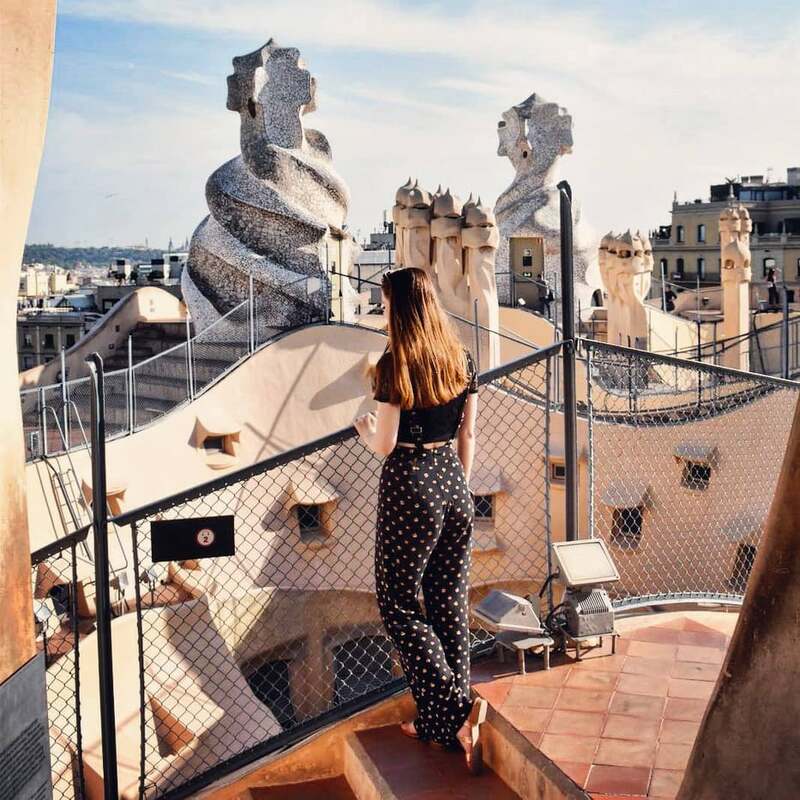 When I was standing on the roof of Gaudi´s building La Pedrera, I felt like I was in a different world. The architecture was strange yet so beautiful and the view was breathtaking. If you find yourself in Barcelona, definitely pay this place a visit. We bought our tickets on spot and we had no problems getting in. It was getting a bit crowded the next day we were passing by so it might be a good idea to be tickets online or at least be ready to wait for a while in a line. Cestovala jsem s architektkou, což je skvělé a zároveň strašné. Nechápejte mě špatně, mám jí hrozně ráda, ale když mi ukazovala úplně obyčejný (aspoň podle mého názoru) strop a povídala o něm hodinu (dobře asi to bylo pár minut), jak je to úžasné, moc jsem nechápala. Díky ní jsem se ale podívala na skvělá místa a nic mi neuniklo. Když jsem stála na střeše Gaudiho budovy La Pedrera, cítila jsem se jako v jiném světe. Architektura byla tak divná a zároveň krásná. No a ten výhled, ten byl dech beroucí. Pokud se do Barcelony dostanete, určitě se tam běžte podívat. My jsme si koupily lístky na místě a neměly jsme sebemenší problém dostat se dovnitř. Když jsem ale šly kolem další den, bylo tu už docela plno, takže doporučuji koupit lístky předem. Nebo se připravit na čekání. Did I mention I love food? 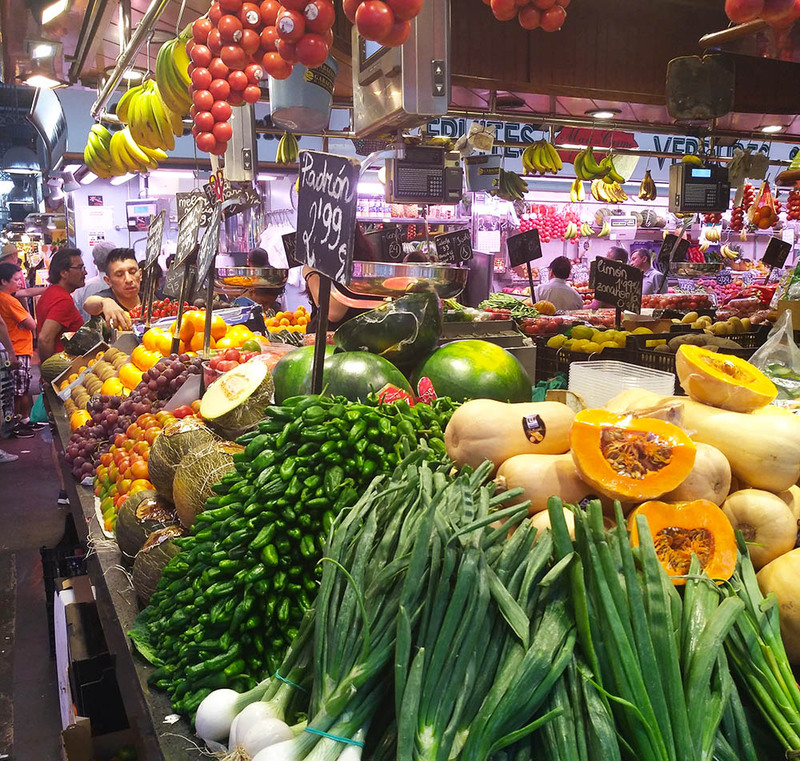 One place you definitely have to visit, even though you might not be a foodie, is a food market Mercat de La Boqueria. It is not only about food, but about the experience. The place is full of energy and everything around you is fresh. You can try their fruit smoothies, get strawberries with chocolate and eat as much seafood as you can. We tried a small stand with seafood and it was so good. We had octopus, shrimps and squids. Zmínila jsem, že mám ráda jídlo? Jedno místo, které si nesmíte nechat ujít, přestože třeba nemilujete jídlo, tak jako já, je tržnice Mercat de La Boqueria. Není to tady jen o jídle, ale i o atmosféře. To místo je plné energie a všechno kolem vás je tak čerstvé. Můžete to zkusit jejich ovocná smoothie, zakousnout se do jahod s čokoládou nebo si pochutnat na mořských plodech. My jsme si sedly k jednomu ze stánků a pochutnaly si na mořských plodech. Chobotnice, krevety, oliheň. 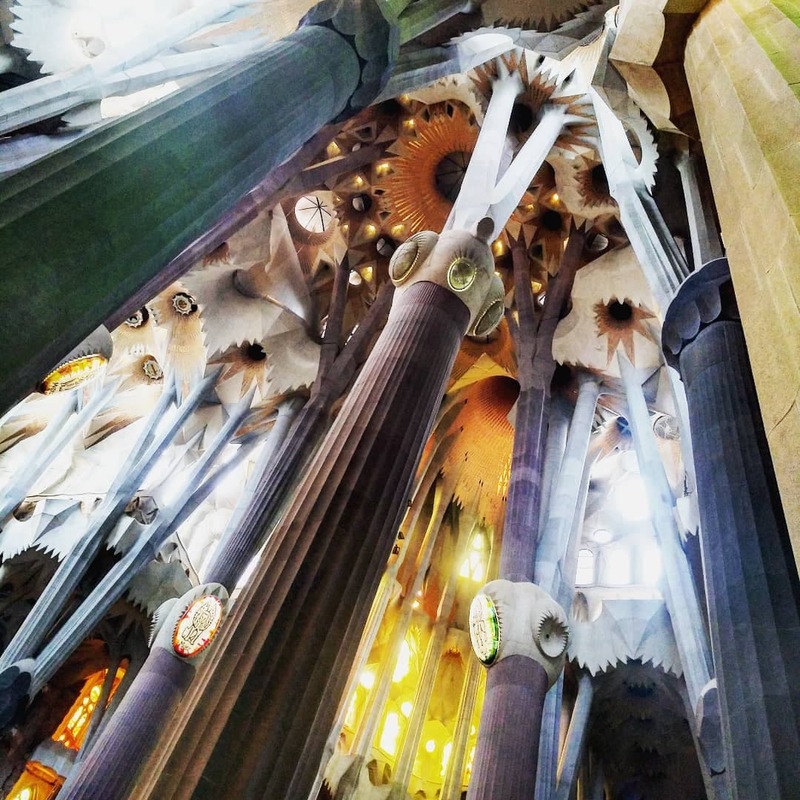 It would be crazy to go to Barcelona and not to visit Sagrada Familia. And guess what? We almost didn´t make it there. We thought we could buy tickets when we were there and there was no point of making a reservation. Oh, how we were wrong. We learnt our lesson when we went to Park Güell and we were politely told that there was no way to get it without online ticket. So we quickly went online and searched for tickets to Sagrada Familia. They were still a few of them left for a next day so we bought them. The building looks ok from outside. It has been under reconstruction for some time, so it does not exactly look amazing. But the inside. Oh damn, that was something else. It is so beautiful, it is hard to explain. You just have to see it. Don´t forget to buy your tickets online! Bylo by bláznivé jet do Barcelony a nenavštívit Sagradu Familia. A hádejte co? Nám se to málem stalo. Myslely jsme si, že lístky koupíme na místě a rezervace není na místě. Jak jsme se mýlily! Dostaly jsme lekci, když jsme dorazily do parku Güell, kde nám zdvořile řekli, že se dovnitř ten samý den určitě bez lístku nedostaneme. Tak jsme rychle zapnuly data a hledaly lístky do Sagrady. Ještě jich tam pár bylo na další den, takže jsme je hned koupily. Sagrada vypadá z venku dobře, ale na zadek jsem se z toho neposadila. Je teď už dlouho pod rekonstrukcí, takže nic moc. Ale vevnitř, to je o něčem jiném. Neskutečná nádhera, která se nedá popsat, prostě to musíte vidět. Takže si nezapomeňte koupit lístky předem! What is your favorite place in Barcelona? Do not forget to check out my blog post from Disneyland! Jaké je vaše oblíbené místo v Barceloně? Nezapomeňte se podívat na můj článek z Disnelandu! This is surely one of the most exceptional cities in the World! Lovely places, thanks for the tips! Thanks for the tips..I'm planning to visit Barcelona this year and its a help. Thanks! I would love to see Barcelona on my own eyes too. And it makes me want it more by looking at your photos. Thanks! They said this is a romantic place and is perfect for couples. Nice photos! They said Barcelona is one of the Romantic place. I would really want to visit there. Thanks for sharing such a wonderful place. I love your fashion sense and style.Styling makes a big difference indeed!Do you have any tips to getting a fashion wardrobe everybody wants while staying on your budget? Can we please go shopping together… right now? The color of your dress is SO incredible!! Excellent reading as always, keep 'em coming!